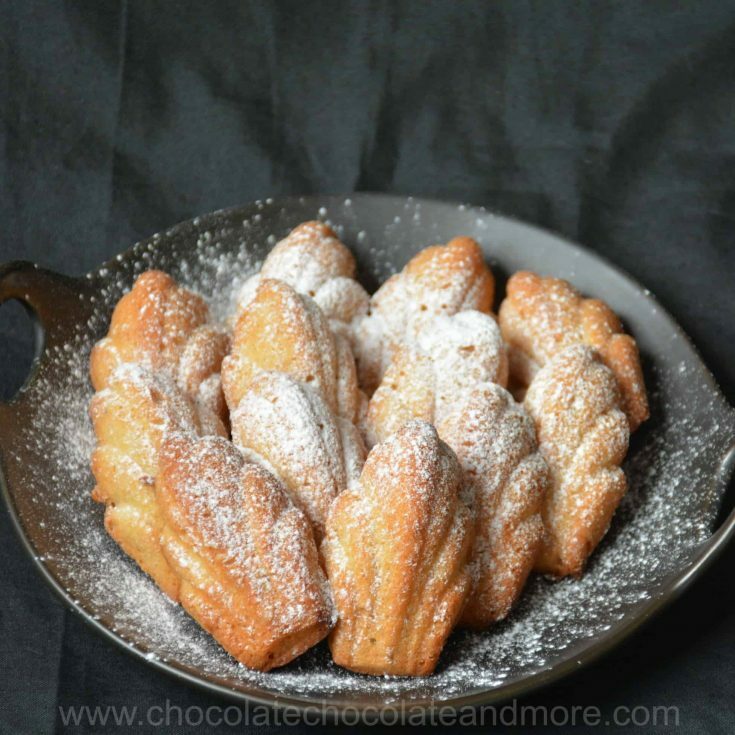 Ginger Madeleines - Chocolate Chocolate and More! Minced stem ginger and pumpkin pie spice add zing to to these light cookies. 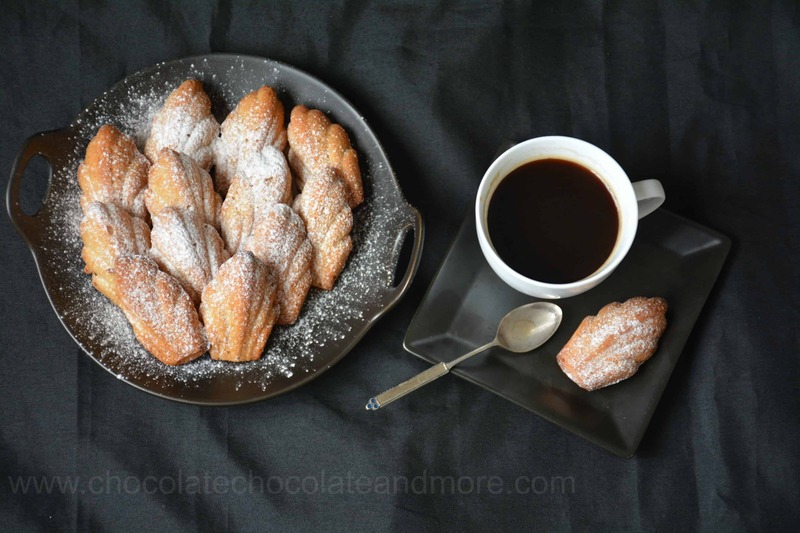 Ginger madeleines are wonderful with tea or coffee and they’re amazing just out of the oven! I love the taste of ginger in baked goods. The zing it gives along with the sweetness is a great combination. When I was in Cambodia, Australian friends introduced me to stem ginger. It’s ginger in syrup. If you’ve ever had crystallized ginger, you’ve had the dried version of stem ginger. They are interchangeable in recipes. This Christmas, I bought a pile of ginger and made little jars of stem ginger for all my friends. It’s so easy to make and much less expensive than buying crystallized ginger. You can find my recipe here. I also like how easy it is to mince stem ginger because it doesn’t stick to the knife like crystallized ginger does. And then there’s the syrup. But I digress. Now on to these yummy cookies. Madeleines are actually small sponge cakes baked in a special mold. I have a steel pan and a silicone one. I love the convenience of the large steel pan but the silicone one works flawlessly every time. Madeleine pans aren’t too expensive and they make such pretty cookies. Regardless of which pan I use, I always grease and flour my pan. There’s nothing more disappointing than having your pretty cookies stick. Little pieces of chewy, spicy ginger add a nice texture element and incredible flavor to these light cookies. 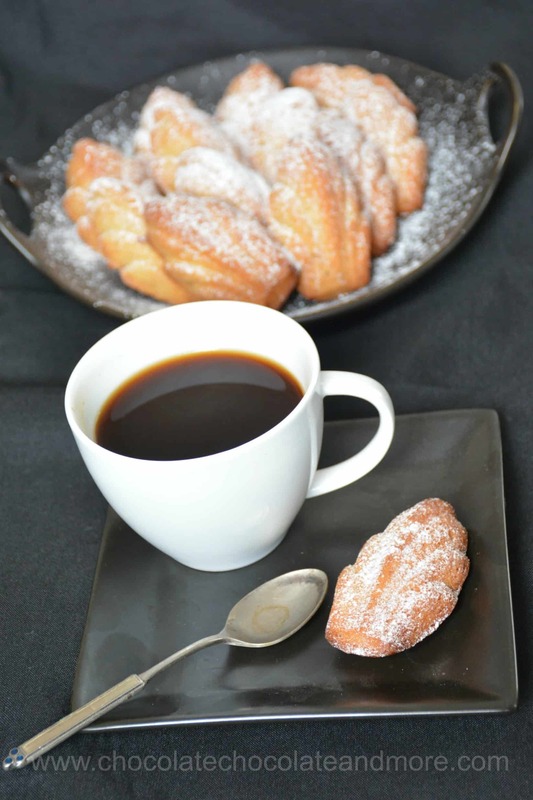 Ginger madeleines are wonderful when they’re warm so have some coffee or tea ready when they come out of the oven. They’re also good cold but you should have a warm one as the cook’s prerogative. Preheat oven to 375°F. Grease and flour madeleine pan. Beat egg yolks and sugar until they are pale and thick. Mix in pumpkin pie spice, melted butter, and minced ginger. Beat egg whites until stiff but not dry. Fold into the batter. Spoon batter into molds. Bake for 16- 17 minutes. Use a knife to loosen the edges and turn out onto a rack to cool. Thanks for stopping by Priyanka! I hope you enjoy them!